The 64-year old John H. Kerr Reservoir has seen a lot of changes and improvements during its lifetime. A lot of those changes have been positive and directly made for the public’s use and enjoyment; among them campgrounds, boat ramps, picnic areas, hiking trails, playgrounds, restrooms and more. About 35 people attended the “by invitation only” event earlier this week at Occoneechee with most of those being public officials from DCR , the US Army Corps of Engineers (which has approved the project), Occoneechee and area park staff and a handful of local officials. 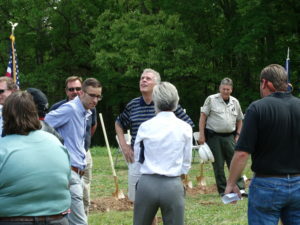 The main attraction was the combining of the ground-breaking and an official visit to Occoneechee by Virginia Governor Terry McAuliffe, who upon election, promised to visit every state park in the Commonwealth. Occoneechee State Park was park to visit and the Governor made his promise become truth. Twice the same day the governor visited the other Kerr Lake Virginia State Park, Staunton River. While at Occoneechee, the affable McAuliffe commented to Kerr Lake Park Watch’s Frank Timberlake that Occoneechee is a “gem” of a park with the added value of being on Kerr Lake. He was surprised to learn that Timberlake has been visiting and/or camping at Occoneechee for over 50 years. 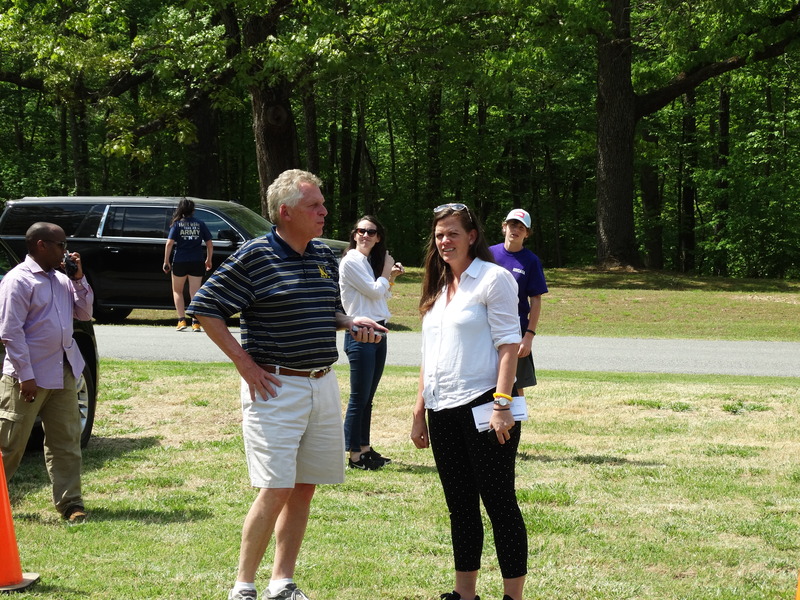 McAuliffe asked Timberlake what has drawn him to the park and the Governor received a long, positive list. 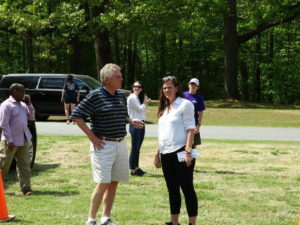 McAuliffe was accompanied by some staff and security people, but he was also accompanied by some family members, including his niece shown below as they discussed the differences in the Kerr Lake parks from other Virginia State Parks. 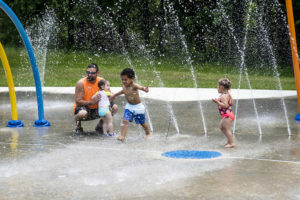 She told Kerr Lake Park Watch that she particularly liked the fact that a major percentage of the water going out into the splashground will be recaptured and recycled through the system. Kerr Lake Park Watch attempted to get more information on the reclamation system and its advantages from DCR but has received nothing by posting time. Earlier this year commenting on the economic impact that Virginia State Parks make to the Commonwealth’s coffers, Governor McAuliffe said that the park system brought in visitor fees of $224 million in 2016. 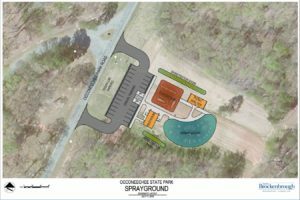 Officials at the ceremony commented that Occoneechee State Park had revenues over $4 million last year. The new “Splashground” will undoubtedly bring in more revenues as it will be a fee-based activity. 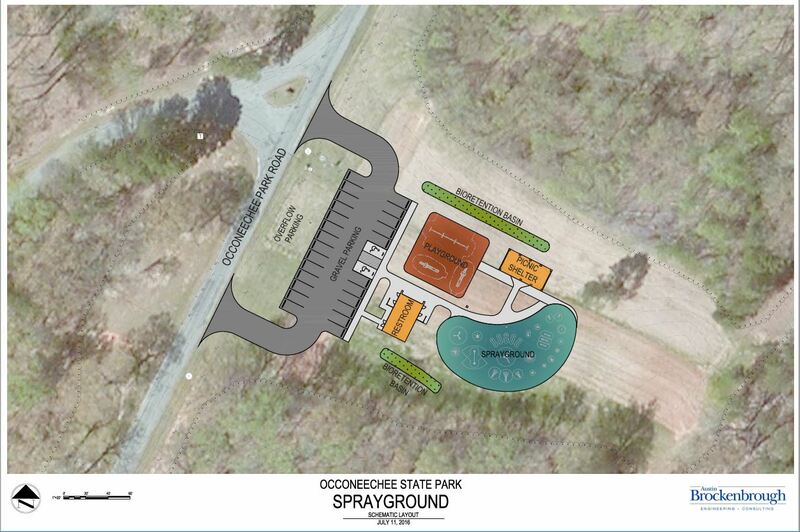 DCR officials anticipate that the Occoneechee splash park charge will be between $5 and $8 per person. 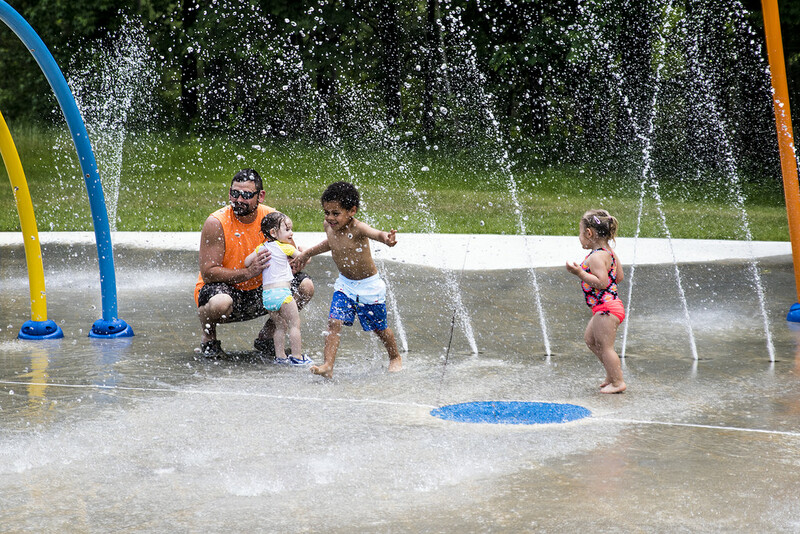 Park officials said that there’s a comparable sprayground at Pocahontas State Park in Chesterfield, and the price there ranges from $5-$8, depending on the age and the day, with children under three getting free admission. Projections on costs for the project that will take about a year to complete are between $1.5 million and $1.8 million. The new splashground is expected to open Spring 2018. Whether you just want to quietly want to walk and observe or really move on down the trail, the Virginia State Parks around Kerr Lake have opportunities for you. 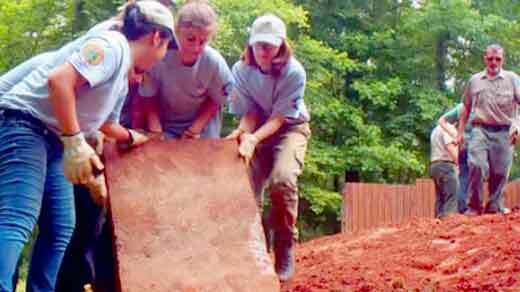 This Saturday, June 6th, is National Trails Days and you can do everything from pick your path at Occoneechee to help clean or build trails at the other parks. Discover below how you can volunteer and or just enjoy! Event time: 8 a.m. – 4 p.m.
National Trails Day is a day to remember how lucky we are to have well-maintained trails for enjoyment in our community. 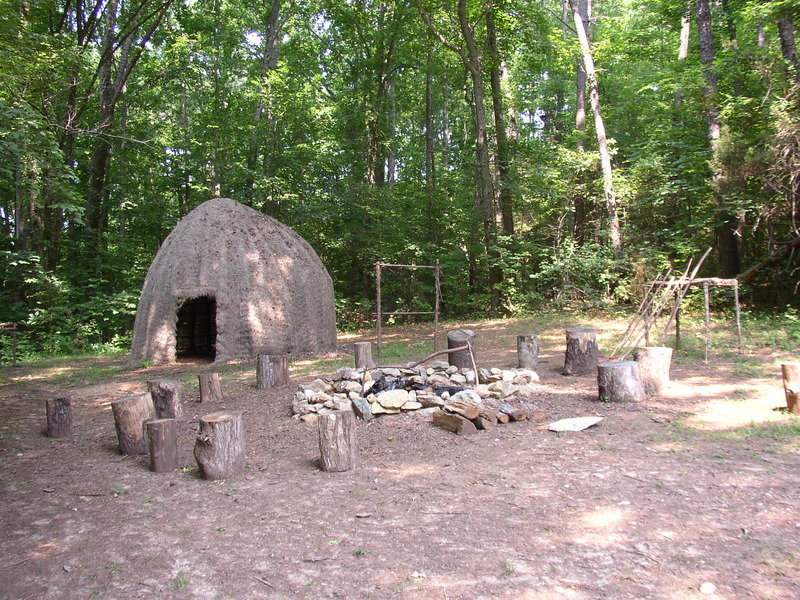 So come out and celebrate at Occoneechee State Park and take advantage of one of the 8 trails the park has to offer. There are surprises at Occoneechee! The 1.2 mile, circular Old Plantation Trail contains interpretive signs that can teach you about the various structures located on the old plantation grounds. It also encompasses the peaceful, scenic landscape of the Terrace Gardens. Bird-lovers will enjoy the 1.1 mile long Tutelo Birding Trail which contains an elevated look-out that can be used to discover the various birds Occoneechee has to offer. The Mossey Creek and Big Oak Nature Trails allow you to get away from everyday stress with tranquil, wooded landscapes that can help you reconnect with nature. The 1.5 mile Mossey Creek Trail contains a small, peaceful creek and connects with the .4 mile Warrior’s Path. If you’ve never seen a beaver dam, then hike the 1.7 mile Beaver Pond Trail to see all the hard work that beavers put into creating their homes. There is also the 7.5 mile Panhandle Multiuse Trail, which can be used for horseback riding and biking. No matter what kind of hike you prefer, Occoneechee has the perfect trail for you. Event time: 10 a.m. – 12 p.m. Hike the River Bank Trail along the Staunton River with a ranger as you conduct trail maintenance, remove debris out of the trail, and look for ways to improve the existing trail system. Along the hike, issues such as trail construction, erosion, and trail maintenance will be discussed so that volunteers will understand why trails require a little TLC from time to time. Virginia State Parks belong to the people, so visit your local state park and help improve it for your fellow nature lovers. At the end of the hike, you will enjoy a free wagon ride back to the Staunton River area. Event time: 10 a.m. – 2 p.m.
Seeking volunteers to join park staff in helping with the initial layout and construction of the new trail surrounding Mulberry Hill Pond. Meet at Roanoke Station. If you would like information on these or other Virginia State Parks, contact, Pat Eastwood, Visitor Services Specialist, Virginia State Parks, Southern Virginia, 434-471-0154.